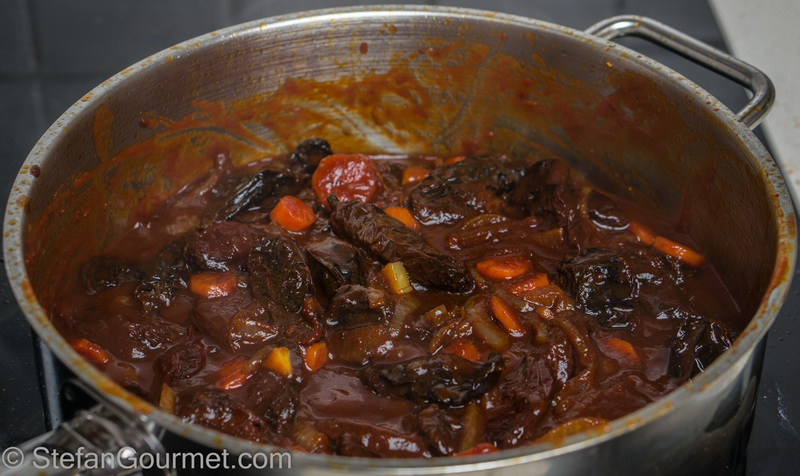 I don’t prepare enough classic French dishes, but luckily Nadia of Maison Travers keeps posting recipes to inspire me to cook more of them. 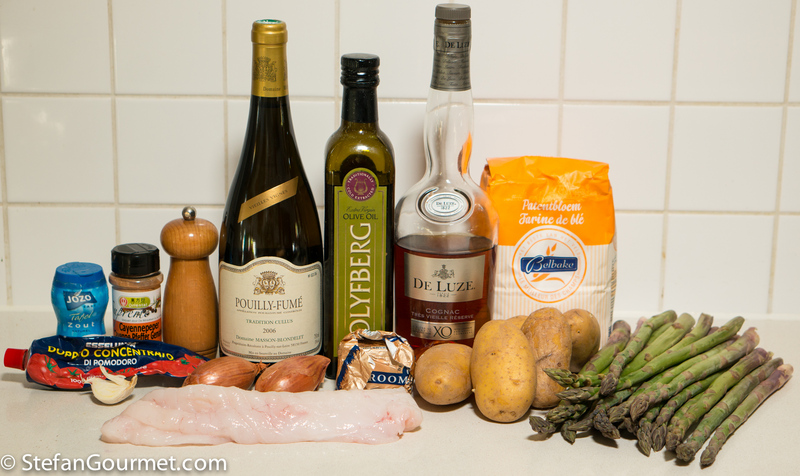 In this case monkfish with Américaine sauce. This sauce, originally named Armoricaine, doesn’t have anything to do with America but has instead been named after Armorica, the ancient name for the West of France (now Bretagne/Brittany). 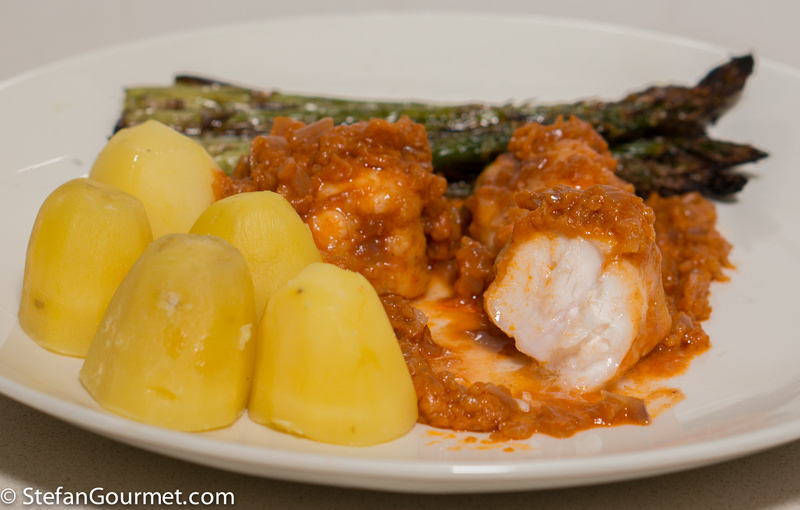 The sauce is made using white wine, tomato, cognac, shallots or onions, and butter, and it does indeed work very well with monkfish, as well as with the potatoes and green asparagus that I served on the side. This dish was delicious and a good reminder that I do need to do more classic French cooking. 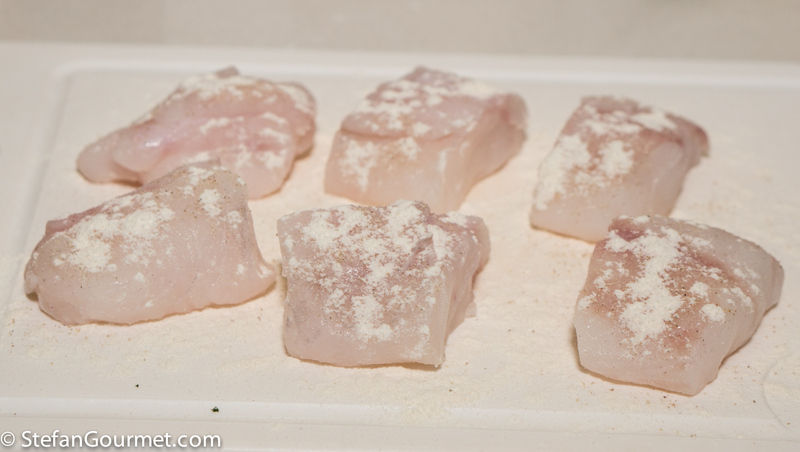 As with all fish preparations, the key is not to overcook the monkfish. When I first saw the recipe my inclination was to cook it sous-vide (no surprises there), but then I decided it wasn’t necessary as I could obtain a very similar result with less hassle by cooking the fish in the sauce over very low heat (mostly in the residual heat of the sauce). This worked very well, as the fish came out very tender and juicy. Here’s my version, adapted from Nadia’s. 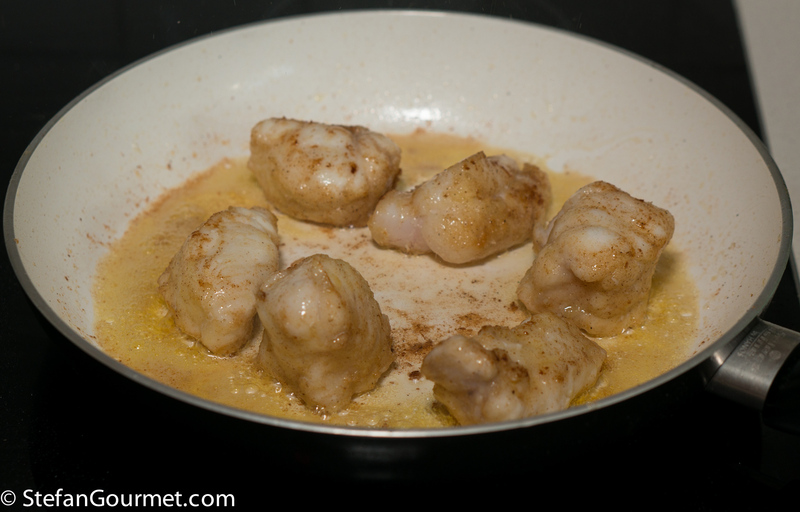 Cut the monkfish into serving pieces, about 3 pieces per person. Season them on all sides with salt and freshly ground white pepper, and sprinkle with flour. 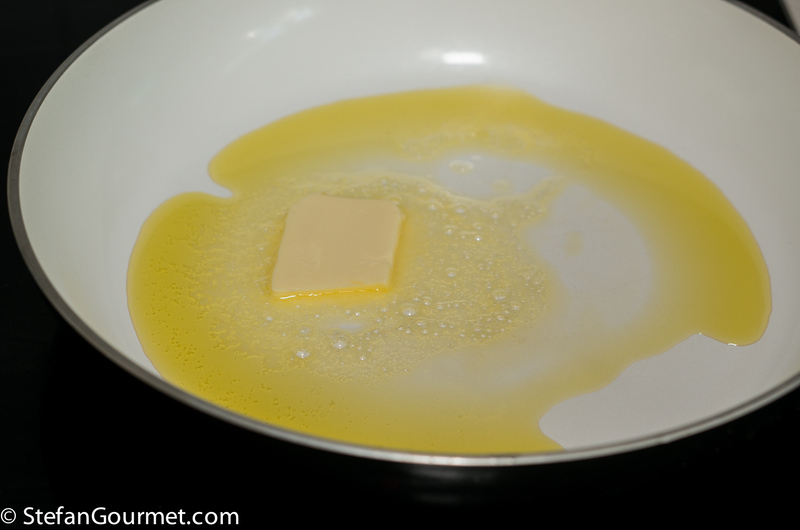 Heat a tablespoon of olive oil with a tablespoon of butter in a non-stick frying pan until the butter has melted. Add the fish pieces (after shaking off excess flour) and brown them over medium-high heat on all sides, then take them out of the pan and set aside on a plate. 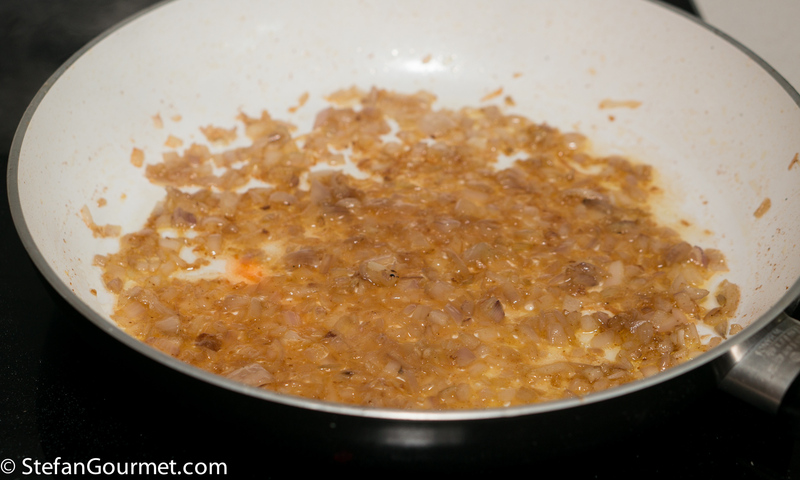 Add 2 minced shallots to the same pan. 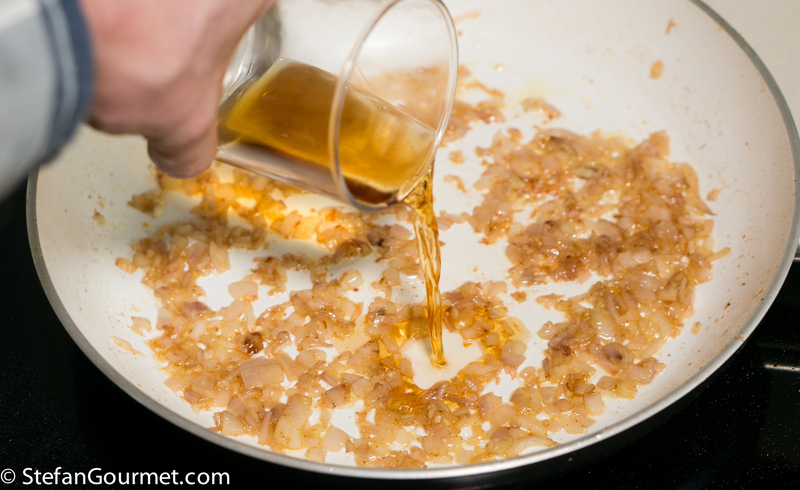 Add a crushed clove of garlic. 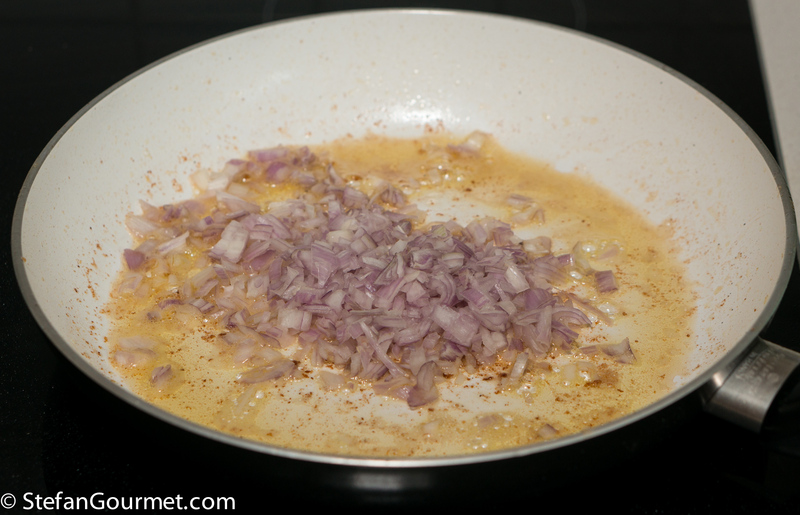 Stir over medium heat until the onions are soft and fragrant, about a minute. …and carefully ignite the booze to flambé (the flames are hardly visible in the photo). 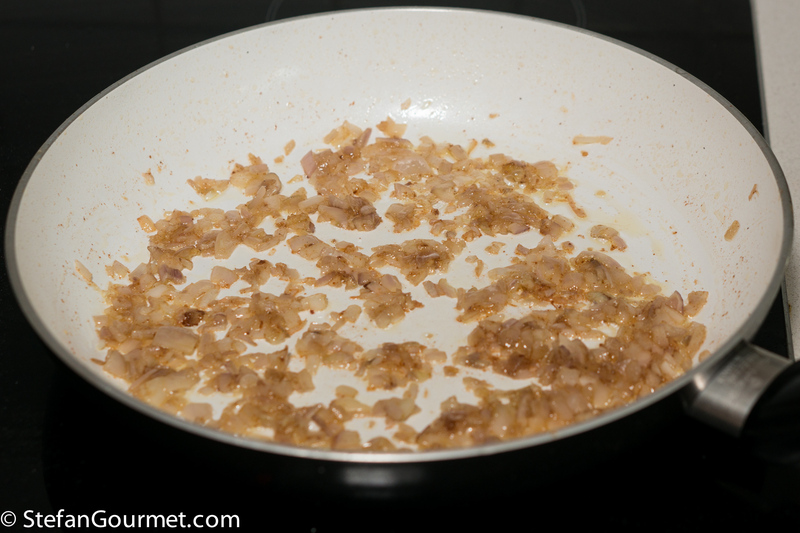 …and add this mixture to the shallots. 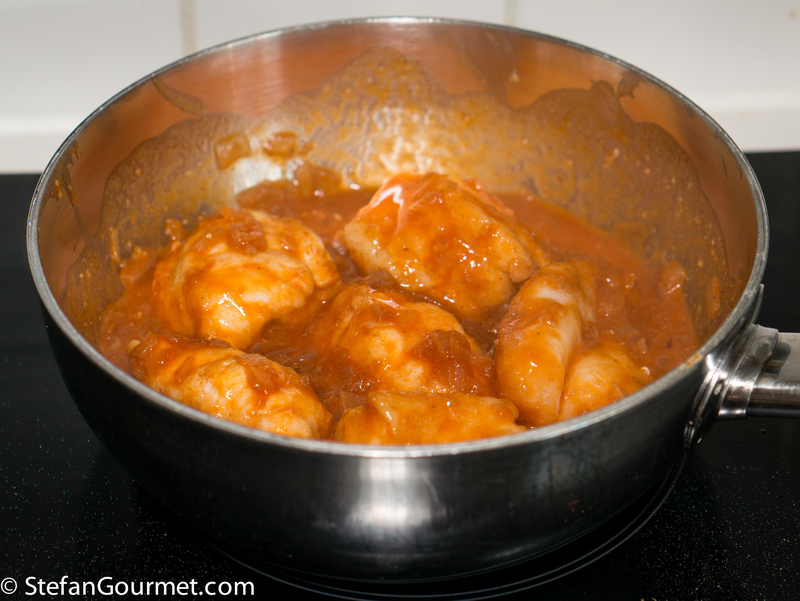 Arrange the browned monkfish pieces in a saucepan in which they fit snugly, then pour the hot sauce on top. Toss the fish with the sauce in order to cover it all over. Cover and allow the fish to cook in the sauce over very low heat. The sauce should not come to a boil. Turn the fish now and then if it is not completely submerged. Keep the fish in the sauce until it is just cooked through. The easiest way to tell this is to use an instant-read thermometer with a probe. If the core temperature is 50C/122F or above, the fish is cooked. To serve, arrange the fish on preheated plates. 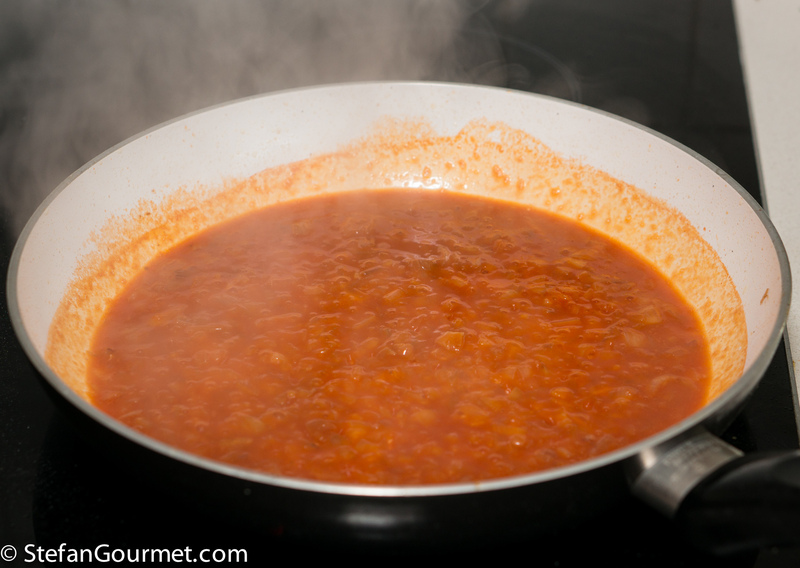 Mix a tablespoon of butter with a tablespoon of flour to get beurre manié and add this to the sauce. 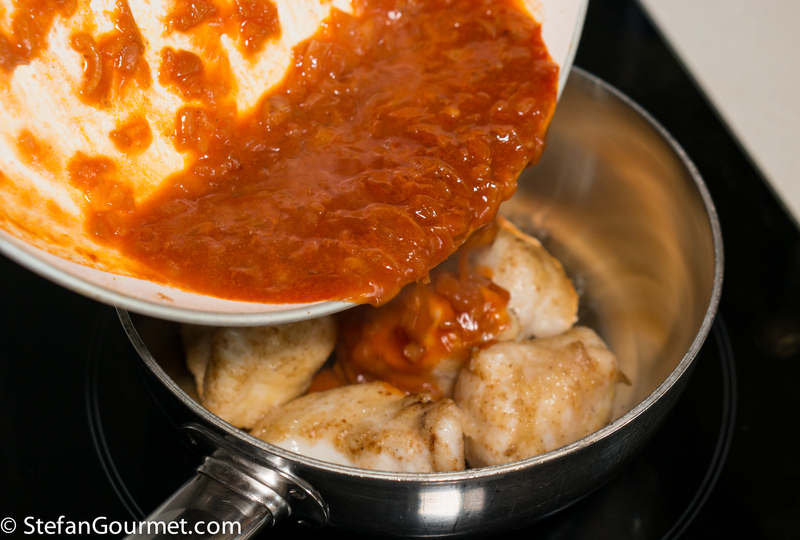 Stir over medium heat until the sauce thickens, then turn off the heat and spoon the sauce over the fish. 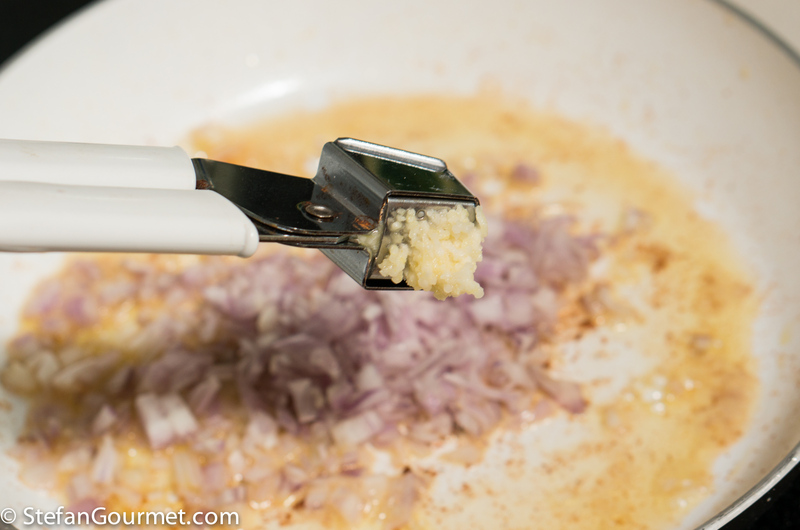 For a smooth sauce, you could use an immersion blender first. That would look better, but I liked the ‘bite’ of the shallots. Serve at once with broiled or roasted asparagus and boiled potatoes. This was amazing with a 2006 barrel-fermented Pouilly-Fumé. 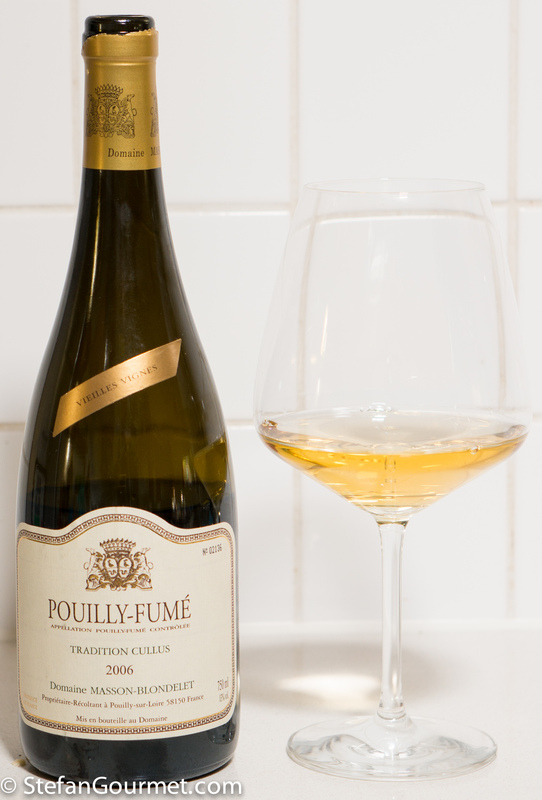 This sauvignon blanc from the town of Pouilly-sur-Loire is not usually barrel-fermented and not usually able to age so well, but this Tradition Cullus from Masson-Blondelet is an exception. 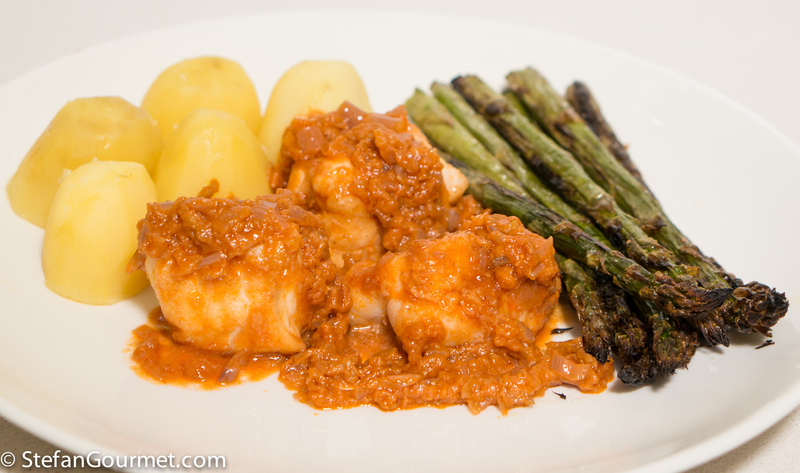 It is amazingly rich and complex, and was spectacular with the fish, sauce, and asparagus. Do you know chipotles in adobo sauce? You can make them at home and then they are even more flavorful. This looks AMAZING and need the wine on our table, too… love all the links to your awesome fish dishes. Well, thank you! Because I also inadvertently have always wondered what ‘America’ had to do with certain recipes!! ALL my favourite ingredients, so ‘guess what’ 🙂 ! I was apprehensive about what the French might put in an “American” sauce, but now I get’cha. What delicious-looking fish! 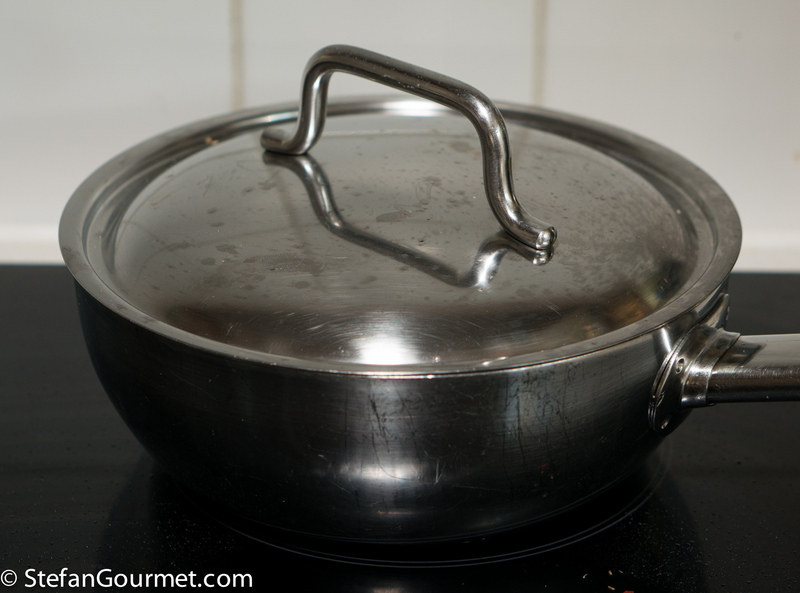 You may need to do more French cooking – I plenty – but I need to cook more fish! So I’m all over this. That looks incredible. Stephane made me something very similar, but he. 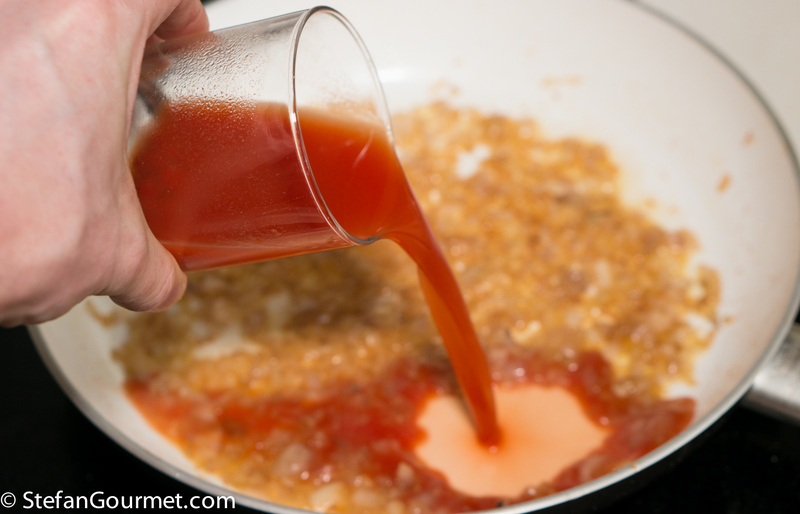 Flambeed the cognac after adding it to the tomato mixture. Fabulous flavors.